Continuity mistake: When Fred gets to the North Pole and the Security elves take him down. Fred comes up and the snow on his face change between shots. Revealing mistake: In the beginning when Nick gets a present from Fred you see that the background is fake. Continuity mistake: After the security elves kidnap Fred and take him to the family invervention, Fred pulls most of the wrapping paper off himself, leaving a small patch of paper stuck to his shirt on his left-hand side. This patch disappears and reappears between shots throughout the rest of the scene. Revealing mistake: When Fred and Nick are fighting on the snowmobile in the background in one shot you can tell that it is painted and it's fake. Other mistake: The ink on the pad and the ink on the stamp that Fred marks the kids "nice" are wrong. If you look at it Fred doesn't hit all the colors in the pad. He only hits one color. 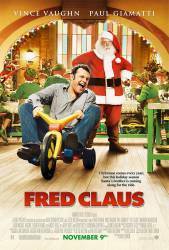 Continuity mistake: In the early part of Fred Claus, Fred throws an apple at the back of Nick's head. You see all the chunks of apple all over Nick's hood and back. However when they pan over again from Fred's point of view, there is no sign of apple anywhere, not on his hood, head or back. There isn't even any on the pillow that he is sitting on or the floor around him. It just vanished. Continuity mistake: At the point when Santa is lying in bed and Fred is saying he would fly the sleigh, Santa has a pink slip in his hand. Through the scene, the pink slip changes from unfolded to folded. Fred then goes out the room and the camera goes back to Santa and the pink slip has gone. Plot hole: In the early part of Fred Claus, the story teller explains that when you become a saint, you become "eternally ageless." However, when you get to the first scene with Santa Claus, he is complaining about the rest of his hair turning white. If he was eternally ageless, his hair would not still be turning white. Plot hole: In the scene with the brothers group, the guys don't believe that Fred is Santa Claus's brother (because they don't believe in Santa). But why don't they believe in Santa? Santa leaves gifts for kids on Christmas. If they don't believe in Santa then where do they think the presents came from? Visible crew/equipment: When Fred is fighting with the DJ about changing the song, you can see a crew member sitting on the director's chair reflected on the glass window. Clyde: You're all fired, in the morning you'll all be on a bus back to Elfistan.